Without doubt one of the most popular players ever to have played the game, five times world champion Ronnie O’Sullivan is also one of the greatest, statistically behind only Steve Davis and Stephen Hendry. Famous for his fast and furious play, O’Sullivan is adept with his left arm as well as his right, something that in the past has proved controversial as well as brilliant. In fact that statement can always be applied to Ronnie, as brilliant as he is on the table, he is often in the headlines for those things he does off it. It is this mix of astounding play and incidents that makes him arguably the most intriguing character in the sport and keeps people coming back for more. As a player though, when he is at the top of his game there are few who can live with him and there can be no doubt that his all-round game is far more solid than it was in the 1990’s. Back then while his long-potting was probably more consistent than it is today, his tendency to take on too many difficult shots and his questionable temperament arguably prevented him from fully maximising his potential. Having played snooker from a very early age, O’Sullivan demonstrated his talent for the sport with a break of 117 aged just ten. He followed this up with a witnessed 142 two years later before winning the British U16 championship the following year aged 13. His first 147 came in the 1991 English Amateur Championship and following victory in the IBSF World Under-21 Championship in the same year it was only a matter of time before he turned professional. 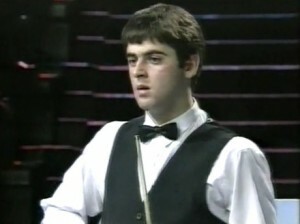 Having done just that in 1992, O’Sullivan remarkably won his first 38 matches, a record unlikely ever to be broken with the qualifying structure now as it is. With his best result being a quarter-final, he ended his début season ranked 57th and it was not long before he was much higher. The following season he won the prestigious UK Championship, beating the two best players in the world, Steve Davis and Stephen Hendry on the way. A second title in the form of the British Open came soon after and his results were good enough to move him up to 9th in the rankings at the end of the season. The next two years failed to produce a ranking title for O’Sullivan but he did win the 1995 Benson & Hedges Masters and his results were good enough to move him up to number 3 in the rankings. In 1997 however he was to enjoy his most successful season to date, winning two ranking event titles in Germany and Asia as well as the Matchroom Premier League. He capped off the year with the fastest ever 147 break, made in just five minutes and 20 seconds in his first round at the 1997 World Championship. His run in the tournament was to be short-lived however as though he was to lose 13-12 to Darren Morgan in the next round. Controversy came his way in the 1997/8 season when he was disqualified from the Benson & Hedges Irish Masters when he was found to have failed a drugs test. 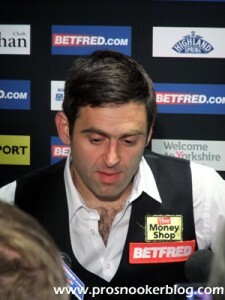 As has become a running theme during his career, an unhappy O’Sullivan stated that he threatened to retire from the sport, though this proved to be unfounded. 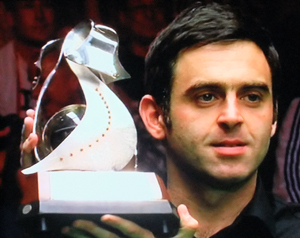 A disappointing couple of seasons then followed before he was to finally capture snooker’s greatest prize. Coming into the 2001 World Championship with five titles already under his belt, it was up to John Higgins to stop him from making it six in the final. It was not to be however as O’Sullivan managed to open up a four frame lead that Higgins never managed to get back, eventually winning 18-14. 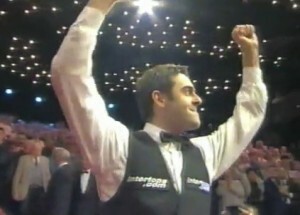 Although he failed to defend the title in 2002, (losing to Stephen Hendry in the semi-finals following what was one of the finest matches ever seen), O’Sullivan reached another milestone in his career by ending the season as the number one ranked player. His second world crown was to come two years later in 2004 when he thrashed Scotland’s Graeme Dott 18-8 in what was a largely one sided affair. This victory was notable for O’Sullivan’s increasingly measured approach, down in part to the help of six-times world champion Ray Reardon who gave him some words of advice. This form continued into the next season, his most successful to date in terms of ranking event victories with three from the seven that he entered. 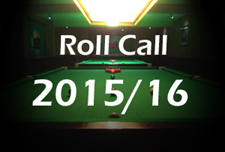 He again failed to successfully defend his world title however, this time losing 13-11 to 2002 winner Peter Ebdon. Again following this match O’Sullivan threatened to quit the game, though as previously this never materialised. What was to follow was a barren run for O’Sullivan, who was not to win another ranking event until the 2007 UK Championship. The intervening years were anything but quiet however with him attracting controversy for walking out of his 2006 UK quarter-final against Stephen Hendry when 4-1 down. He also attracted criticism during that year’s World Championship when he removed the tip from his cue during his match with Graeme Dott. This meant that that there had to be an unscheduled break for him to fit a new one, though it did him little good as he lost the match 18-11. He did fare better in the invitational events however, managing to retain his stranglehold over the invitational Premier League and take his third Masters title with a dominant victory over China’s Ding Junhui in 2007. The 2007/8 season was his most consistent for while and saw him reach the final of four world ranking events, winning two. The first of his victories was to come in the UK Championship in Telford where having beaten Mark Selby with a 147 break in the deciding frame of his semi-final, he thrashed Scotland’s Stephen Maguire 10-2 in the final. He then followed this up in May 2008 with his third world title, secured against another man making his début in a final, Ali Carter. These victories ensured that he moved back to number 1 in the rankings for the first time since 2006. At the start of 2008/9 he picked up where left off by taking his 21st ranking event victory, this time in the Northern Ireland Trophy against Stoke’s Dave Harold. He looked like becoming only the third man to win three consecutive ranking events (after Hendry and Davis), when he followed this up by reaching the Shanghai Masters final soon after, but was upset by world number 35 Ricky Walden who took his maiden ranking event title with a shock 10-8 victory. Following that defeat Ronnie struggled to find his best form, losing out to Bristol youngster Judd Trump in the Grand Prix, Joe Perry in the UK Championship and Marco Fu in the Welsh Open. Many expected him to improve in Sheffield when he began the defence of his world title but it was not to be as he slipped to a 13-11 defeat to Mark Allen in the last 16. Due to his excellent 2007/8 season and his consistency the following season however, his opening round win over Stuart Bingham ensured that he would remain at the top of the rankings for a second consecutive season. Despite this mixed form in the ranking events, he continued to enjoy success in the invitational events however, taking a fifth straight victory in the Premier League whilst taking his fourth Wembley Masters crown by ending the reign of defending champion Mark Selby in the final. This victory was made all the more remarkable by the fact that he did it with a new cue after smashing his old one up during a practice session the week previously. Despite starting 2009/10 with yet another new cue, Ronnie got his season off to the perfect start by winning his 22nd ranking event title out in Shanghai. Having come through a tough draw which put him up against the likes of Marco Fu, John Higgins and Graeme Dott, all players who have favourable record against him, he comfortably had the better of first-time finalist Liang Wenbo to give his chances of retaining the world number one spot a significant boost. Unfortunately however it was to be John Higgins, his main rival for that top spot, who would be his nemesis in the next two tournaments, defeating him 5-4 in the last 16 of the Grand Prix and then 9-8 in the semi-finals of the UK Championship. The latter in particular was full of drama as he recovered from 8-2 down to force a deciding frame, only to see a missed pink pave the way for a Higgins counter. Away from the ranking events O’Sullivan moved into the final of the Premier League as but this time he was to finish second best as world number three Shaun Murphy ended his run to take the title for the first time. Incredibly this marked the first time that O’Sullivan had not won the tournament since the shot clock was introduced back in 2005. The second half of Ronnie’s season continued in much the same manner as he reached the final of the Wembley Masters only to see his title defence ended by Mark Selby who produced an impressive comeback from 9-6 down to win. At the Welsh Open he again lost out to Higgins in the semi-final before he crashed out of the China Open at the last 32 stage to wildcard Tian Pengfei, a shock result that confirmed that Ronnie’s reign as world number one would come to an end in 2010/11, Higgins taking his place. Ronnie rounded off his season at the World Championship with a run to the quarter-finals where his bid for a fourth Crucible crown was ended by Mark Selby who produced yet another comeback against him, this time from 9-5 down to win 13-11. 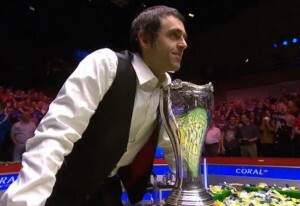 Ronnie began the 2010/11 season well with runs to the quarter-final of the first Players Tour Championship before making it all the way to the final of the third event in Sheffield. An unlikely comeback by Barry Pinches however was to deny him his first silverware of the season and another final defeat was to follow at the inaugural World Open tournament as he was comprehensively outplayed by world champion Neil Robertson. The tournament was not without note for Ronnie however as during his last 32 match against Mark King he notched his 10th maximum break in competition, controversially having to be talked into potting the black by referee Jan Verhaas having initially shaken Mark’s hand following the pink. From here however O’Sullivan was to enter arguably the worst slump of his career as having already withdrawn from the Shanghai Masters, he lost in the first round of the UK Championship to Stuart Bingham before withdrawing from several EPTC events and the German Masters. Further early defeats came to Mark Allen at the Masters as well as Ryan Day in both the Welsh and China Open tournaments which left him contemplating whether to withdraw from the season-ending World Championship. Ultimately though he was to play and although he was not at his best, he was able to reach the quarter-finals for a second successive season with victories against Dominic Dale and Shaun Murphy. 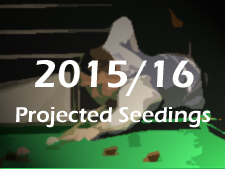 Defeat to eventual winner John Higgins however meant that he would finish the season ranked down in 11th. Knowing that an improved season would be needed in 2011/12 if he was to avoid losing his place in the world’s top 16, Ronnie began in ominous fashion by winning the PTC1 event in Sheffield with a 4-0 final victory against Joe Perry. 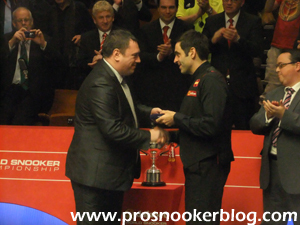 On the opening morning of the tournament it looked like Ronnie might have been heading for an early exit as he trailed veteran Mike Hallett 2-0 but he came back to win that one and added the scalps of players such as Andy Hicks, Martin Gould and Stuart Bingham on his way to the title. Further consistent performances came at the PTCs, notably a second title at the PTC7 event in Gloucester as well as an eleventh maximum break in Furth, but his performances in the full ranking event tournaments were not to match these as he lost at the last 16 stages of both the Shanghai Masters and UK Championship to Anthony Hamilton and Judd Trump respectively. Furthermore he actually came within a frame of falling out of the top 16, only to survive as Anthony Hamilton recovered from 3-2 down to defeat challenger Mark Davis at PTC11. He was though able to win the Premier League title for a record tenth time, while he also reached the final of the invitational Power Snooker Masters, losing out to Martin Gould. 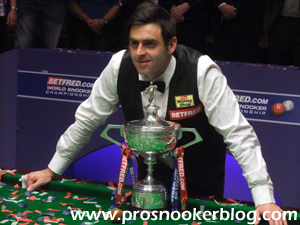 In 2012 Ronnie began with a quarter-run at the Masters, before in Germany he went all the way, defeating Andrew Higginson, Joe Perry, Matthew Stevens, Stephen Lee and then Stephen Maguire to capture his first full-ranking event title since the 2009 Shanghai Masters. Trailing Higginson 4-0 in the opening round, such a triumph looked unlikely, but a superb recovery helped see him through a 5-4 winner and to set him on his way to the title. From there he reached the semi-finals of the Welsh Open where he lost out 6-2 to Mark Selby, but his greatest victory of the campaign was still to come at the season-ending World Championship. There Ronnie defeated Peter Ebdon and Mark Williams in the early rounds to set-up a blockbuster quarter-final with Australia’s Neil Robertson at the Crucible. With a 13-10 victory, Ronnie duly advanced to the semi-finals and from there was never really troubled, defeating Matthew Stevens and Ali Carter to lift the World Championship trophy for a fourth time. 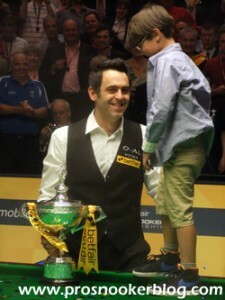 Ronnie’s success also saw him finish the season ranked back inside the top 10 at number 9. 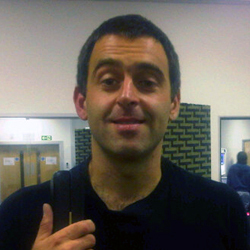 Following his Crucible success, Ronnie O’Sullivan made good on his promise to take a sixth month sabbatical from snooker, as he missed the first half of the 2012/13 season, citing a contractual dispute with the governing body. As this was resolved, Ronnie returned to the baize at the UKPTC3 event, losing out to Simon Bedford in the opening round, before later announcing that he would not compete again on the main tour during 2012/13, due to personal reasons. Ronnie subsequently decided to return to defend his world title at the Crucible however, defeating Marcus Campbell, Ali Carter, Stuart Bingham, Judd Trump and finally Barry Hawkins to capture a fifth world title at the Sheffield Theatre. Notching up a record six century breaks during the final, O’Sullivan rarely looked threatened during the tournament and indicated that he will return for more tournaments during the following season. Having sat out almost all of the previous campaign, Ronnie was to make almost an immediate return to action following his latest World Championship victory, reaching the quarter-finals of the first European Tour event of the season in Sofia. A third round run followed a couple of months later in Doncaster, before he won his next event, the Paul Hunter Classic in Germany, easily defeating surprise finalist Gerard Greene 4-0. His first appearance at a major tournament saw him lose out to home favourite Liang Wenbo at the last 32 stage of the International Championship, before he returned to winning ways at the Champion of Champions event in Coventry, winning a series of close matches, culminating in a 10-8 victory against Stuart Bingham. Bingham’s revenge was soon to come however, as he recorded a surprise 6-4 win against Ronnie at the very next event, the UK Championship in York, before O’Sullivan finished the year with a surprising defeat to Thailand’s Thepchaiya Un-Nooh in qualifying for the German Masters. Another record was to be broken on his way to victory against Ding at the Welsh Open, as he completed a 9-3 win against the Chinese number one with the 12th maximum break of his career, the highlight of which was an exceptional positional shot from the final red to screw back for the black. Following his success in Newport, Ronnie would enter just two further events during the season, the Players Championship Grand Finals, where he was to suffer a surprise defeat at the hands of Yu Delu, before he was to begin the defence of his world title at the Crucible. As he had done in previous years, O’Sullivan was able to make it through to the final, although not without a real scare early on as he found himself 11-9 down to Joe Perry in the second round, before winning four consecutive frames to turn the match around. Subsequent ‘session to spare’ victories followed against Shaun Murphy and Barry Hawkins, before he met Mark Selby in the final. Early on, it was Ronnie who looked to have the upper hand, leading 7-3 and 10-5 during the second session of the match, but it was not to be his year this time as Selby staged a remarkable comeback, to eventually win 18-14 and capture his maiden world title. 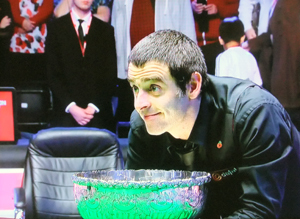 Nevertheless, for O’Sullivan it had been a successful season as a whole and enough for him to climb back into the world’s top four, as a result of the change to a prize money based ranking system. 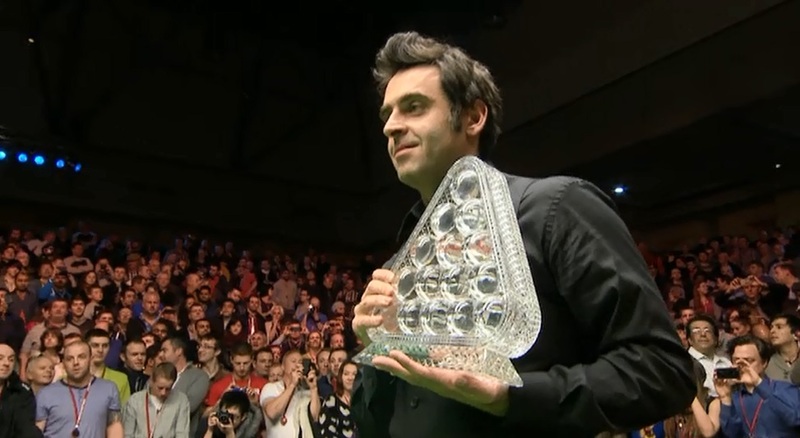 Ronnie’s strongest performances during the 2014/15 season were to come towards the end of 2014 as he twice defeated Judd Trump to win both the Champion of Champions and UK Championship events. Having previously reached the quarter-finals of the International Championship in Chengdu, he arrived in Coventry looking to successfully defend the Champion of Champions title that he had won 12 months earlier. He began with victories against Stuart Bingham, Marco Fu and Ding Junhui, before edging out Judd Trump 10-8 in what would prove to be one of the best matches of the season. 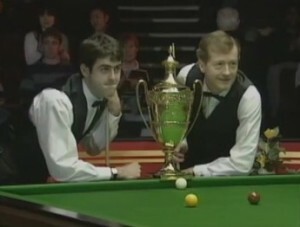 His preparations ahead of the subsequent UK Championship were far from ideal as he injured his ankle whilst running, but despite his obvious discomfort at the Barbican Centre, he would go on to claim a fifth UK crown with a 10-9 victory against Trump that was more dramatic still than their clash in Coventry. 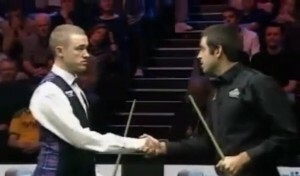 After the turn of the year Ronnie’s form was though to dip as he lost in the semi-finals of the Masters to Neil Robertson,but during the tournament he was able to create history as he surpassed Stephen Hendry’s career total of 775 career century breaks during his quarter-final win against Marco Fu. He made it through to the final of the inaugural World Grand Prix, this time losing out to Trump, before ending the season with a quarter-final defeat to eventual champion Stuart Bingham at the Crucible, his earliest defeat at the World Championship since 2011. This meant that his world ranking would drop one place to fifth at the end of the season.